Hogan is the Navaho name for a tent; two tents are Naki-hogan or Atl-sa-hogan. This game was taught to Dr. Haddon, in 1901, by the two old Navahos in Chicago. (Haddon, 5, p. 221, pl. xv, Fig. 1.) An example of the finished pattern is preserved in the Philadelphia Free Museum of Science and Arts; No. 22723, collected by Mr. Culin, from the Navahos at St. Michael's Mission, Arizona. Second: With the mouth, take up, from the centre of the figure, the four crossed strings, and draw them toward you and hold them firmly (Fig. 268). 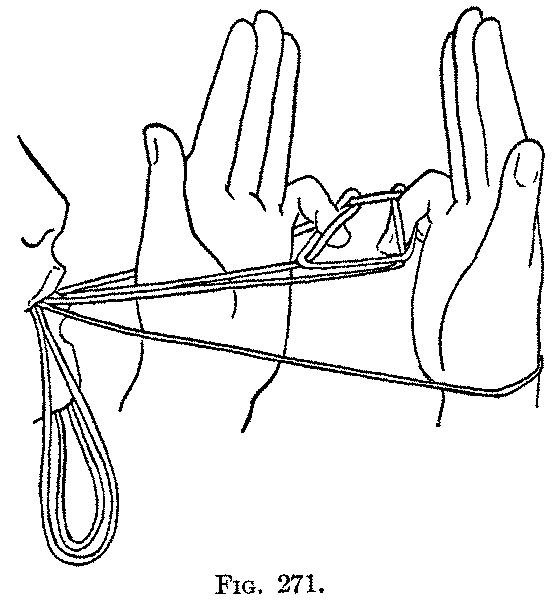 Third: Release the loops from the thumbs and index fingers, and let them hang down; the index loops form two short hanging loops, the thumb loops form one long hanging loop. Fourth: Put each hand up from below completely through the loops held by the little finger (Fig. 269); bend the hands down away from you, with the palms facing each other and the fingers pointing downward, and pick up from the near side with the backs of both little fingers the long hanging loop, drawing it out away from you under and past the far wrist string. Turn the hands with the fingers pointing upward (Fig. 270). 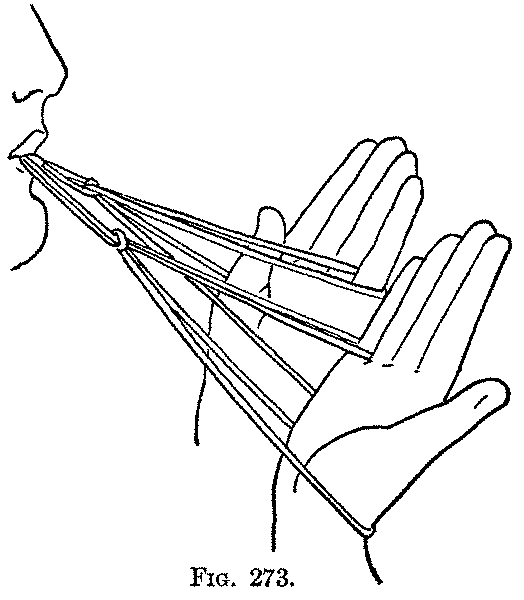 You now have a lower loop held by the mouth and passing around both wrists to become the lower far string of the figure; and a triangle produced by a string on each side passing from the mouth and running between the ring and little finger to become the upper far string of the figure. 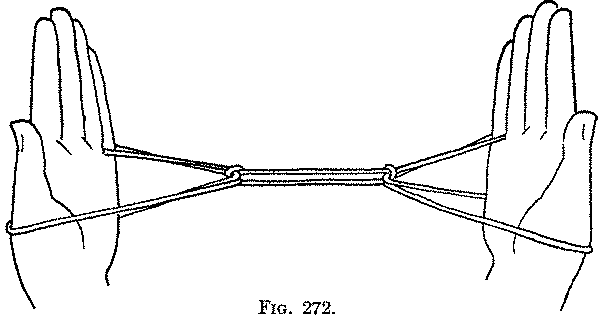 The original index loops hang down from the mouth. 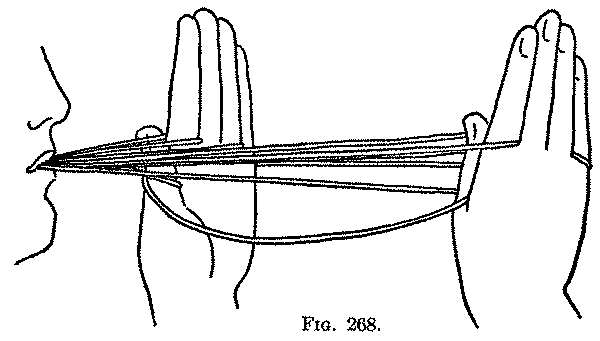 Fifth: Still holding the strings in the mouth, and keeping the loops securely on the little fingers, turn the palms slightly toward you, and, bending each little finger down over the near little finger string, pick up from below on the back of the finger the diagonal string running from the mouth to the little finger, and return the little finger to its usual position, drawing the diagonal string upward and outward through the little finger loop (Fig. 271). 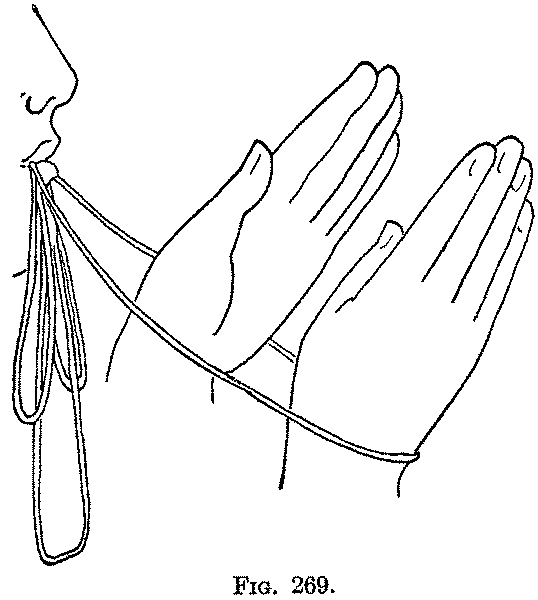 Sixth: Release the strings held by the mouth and separate the hands (Fig. 272). 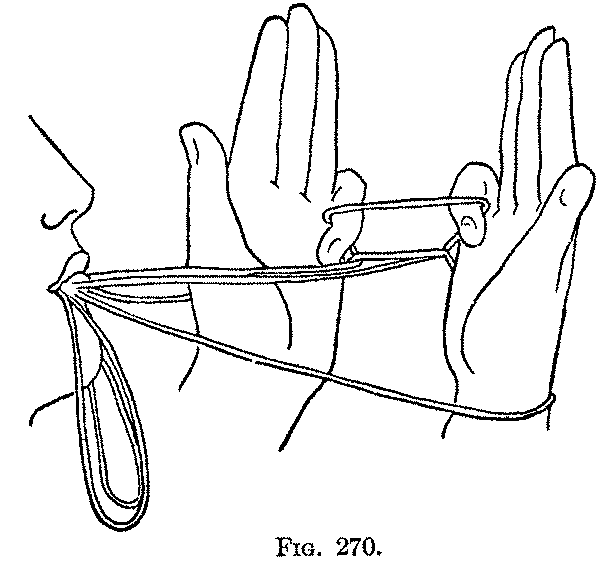 Seventh: Take up with the mouth the middle of the two strings passing between the knots in the figure, and turn the hands with their palms up and the fingers directed away from you; in this way a hogan, or tent, is formed on each hand by the wrist and little finger loops (Fig. 273). "Two Hogans" is interesting because the loops are held by the teeth almost throughout the entire figure. It is not unusual for one or more loops to be taken up by the teeth, but, as a rule, it is done merely through one or two movements, in order to bring the strings into a position from which they can be conveniently taken up by the fingers. The figure produced by the Sixth movement is similar to the finished figure of the "Leashing of Lochiel's Dogs"; the loops, however, being held on the wrists and little fingers instead of on the middle fingers and little fingers.